The Professional has done it again. Who would have thought on this Saturday night I would be indulging in bliss. Nestled deep in the streets of Old Town Alexandria, we arrive to this small brick front restaurant. I would describe it as a café but has the cuisine and wine selection of a top-rated restaurant. This is definitely your friendly neighborhood café and IT IS PACKED! We’re asked if we would like coffee or wine. My two addictions; of course, I want both. We choose wine and we’re handed a wine menu. I order a Pinot Noir from Oregon and The Professional orders a Pinot Noir from California. I apologize, I didn’t’ make a note of the Pinot Noir because it was eh… The California Pinot Noir was lighter in color but had more body than the Oregon Pinot. Time for Dinner – Our prosciutto flatbread has arrived. The flatbread is more like a corn tortilla with melted cheese topped with prosciutto. My mouth is filled with flavors of smoky, garlic, herbal olive oil and roasted prosciutto. This is best way I can describe the dish, since we didn’t see it on the menu and saw our very close neighbor order the DELICIOUS dish. 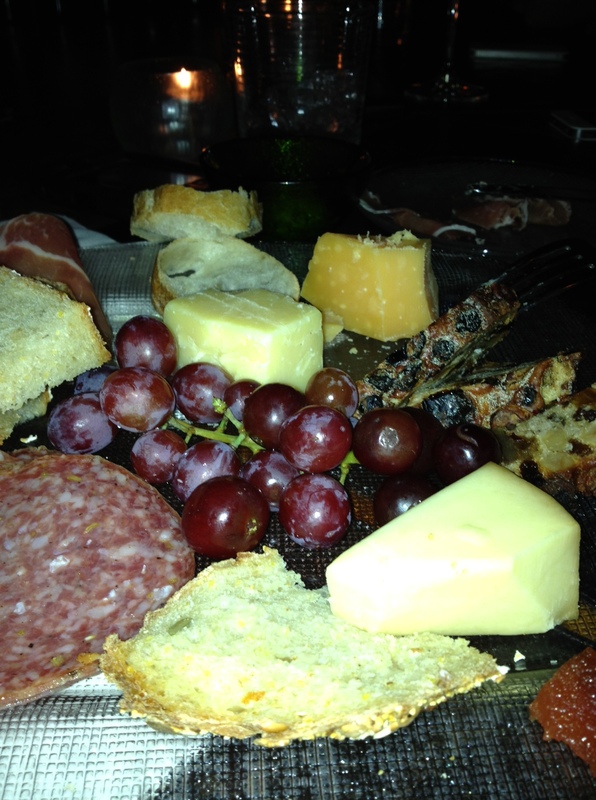 We’re still hungry and ordered a beautiful plate of cheeses, fruit, breads and meat. 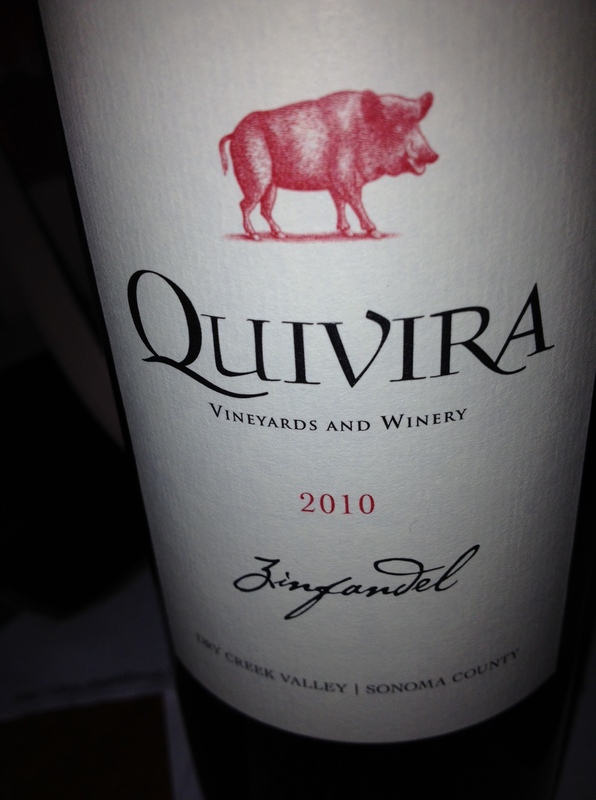 My glass is empty and I just ordered a bottle of the 2010 Quivira Zinfandel that can be corked and taken home. I’m writing while I place in my mouth a piece of creamy Gouda …mmm… then a piece of Irish cheese. OMG, this is DELIGHTFUL! The Zinfandel pairs very well with the variety of cheeses. The Irish cheddar has a slight herb, but I’m also picking up some floral flavors. (Exhale) I taste the salami – light not as sharp as I expected. American Artisan Flatbread (A la Roses Café, San Francisco), crisp flatbread with creamy traditional Crescenza-Stracchino cheese from Lombardy, Italy; topped with shaved Prosciutto + Fresh Thyme drizzled with white truffle oil. 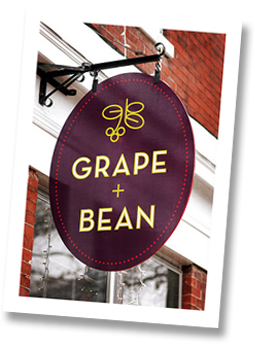 By the way, Grape and Bean conducts wine tasting and wine classes. I can’t wait to go back and try their coffee. FOLKS THIS IS A MUST VISIT! I do have the knack for finding great places. That wine was fab! !